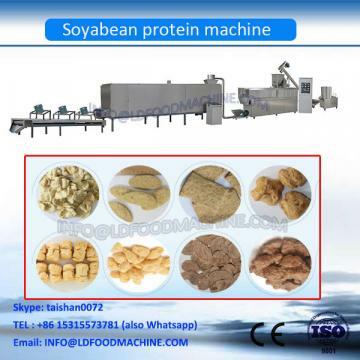 High fiber tissue soya protein production line uses the defatted soya/peanut flour as the raw materials.By high temperature and high pressure,the materials can be re-cognized and shaped into different shapes such as pipe,stick,ball,chunks and so on.As this line make more concentrated and healthy protein,it has become the most popular in the world. Dry protein-based ingredients, liquids and steam are mixed and heated in a pre-conditioner. The paste is then conveyed to a twin-screw extruder where it is processed thermo-mechanically. This allows proteins to be denatured, to deactivate certain enzymes that cause rancidity, to destroy growth inhibitors and to reduce bitterness. The mix then goes through the die where protein macromolecules are cross-linked to form a cell-based structure and to size the final extrudate. Product texture is then determined by laminar shearing of the protein and evaporation. A rotating blade then cuts the product as it comes out of the die. Cooling and drying to reach 10% or less moisture content complete the process. The product can then be packaged and sold as an ingredient or directly rehydrated and incorporated into complete meals. We provide complete installation and operation manual in english for all the machines supplied by us.customer can install and operate machines using the same.If needed,we can send our technician for the installation of the machines a customer’s place on chargeable basis. can manage everything easily without any problem. 1 How long will your company deliver goods after payment down? We will deliver foods in 25 days after payment down. 2 How much is the area? The space is based on the machine you choose. We have three models processing line SLG65 ,SLG 77 and SLG85. . If you have any question ,please let m know. 3 What is the nearest port? The nearest port is QINGDAO PORT. Usually we deliver foods in this port .If you require other port, we could arrange. 4 Can the machine change? 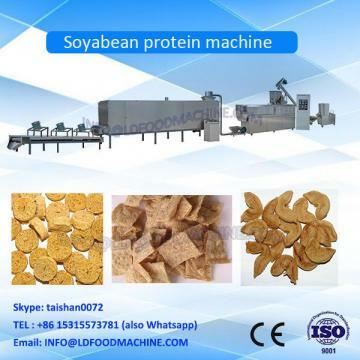 If you have any problems in your daily production, welcome to contact us. We will try our best to serve you. Our engineer can go to solve the problems if needed.Thus, if the machine does not suit you, you can return to us and you will be responsible for the transportation expense.